The hygienic appealing way to vacuum pack meat, seafood, coffee, deli goods, etc. NX Vacuum packers produce strong airtight seals on layered barrier bags. Made from stainless steel, all models are PCB controlled with a cool-down cycle. The V models have doomed lids for bulky items. Compact, economical, versatile for low-mid volume packing in restaurant, hotels, canteens, etc. 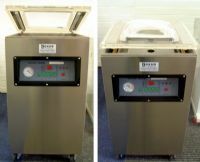 Simply set vacuum time and sealing time; the lid opens automatically when the vacuum/sealing cycle ends.